Earlier today, Al Qaeda’s propaganda arm released a statement condemning the recent American counterterrorism operation in Yemen. US Central Command (CENTCOM) has confirmed that “civilian non-combatants were likely killed in the midst of a firefight during” the raid in Yemen on Jan. 29. The casualties “may include children,” CENTCOM stated. As Sahab, al Qaeda’s propaganda arm, portrays the operation as part of an allegedly broader campaign against all Muslims. 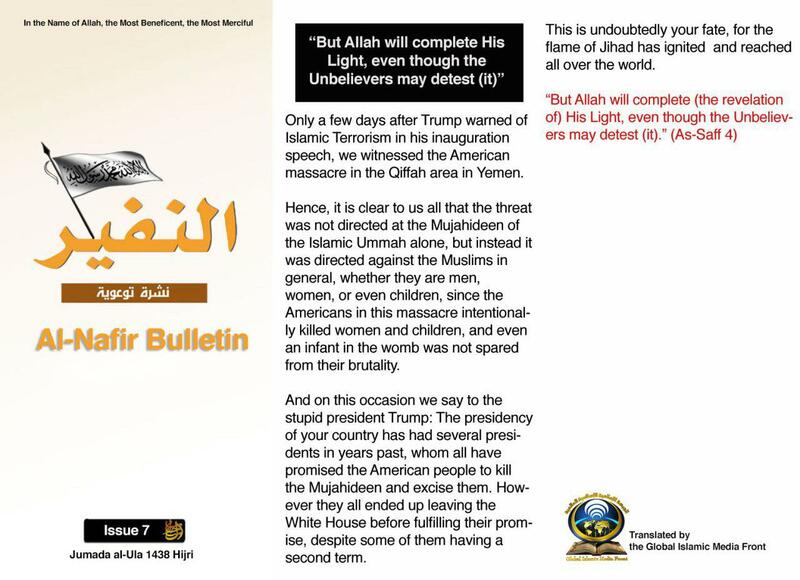 “Only a few days after [President] Trump warned of Islamic Terrorism in his inauguration speech, we witnessed the American massacre in the Qiffah area in Yemen,” the seventh issue of Al Qaeda’s Al Nafir Bulletin reads. The raid encountered multiple problems. A Navy SEAL, Chief Special Warfare Operator William “Ryan” Owens, was killed in the firefight. Several others were wounded. In addition, a MV-22 Osprey aircraft had to be destroyed after making an abrupt landing. Press reports have raised a number of questions concerning the level of planning behind the operation. Nonetheless, al Qaeda used its statement to send a message to the new American president. Al Nafir was first released in Arabic and then translated into English by the Global Islamic Media Front, which is affiliated with al Qaeda. Al Qaeda and its online channels moved quickly to denounced the US for killing women and children. And these same social media sites posted photos of several children allegedly killed during the assault. One of them is purportedly the 8-year-old daughter of Anwar al Awlaki, an American-born jihadi who became one of AQAP’s top ideologues and an operational planner. Awlaki was killed in an American drone strike in Sept. 2011. His 16-year-old son, Abdulrahman al Awlaki, was killed in a separate drone strike in Oct. 2011. Pictures of the girl, Nawar Anwar al Awlaki, and other deceased children have been posted on dozens of al Qaeda-related and other social media sites. 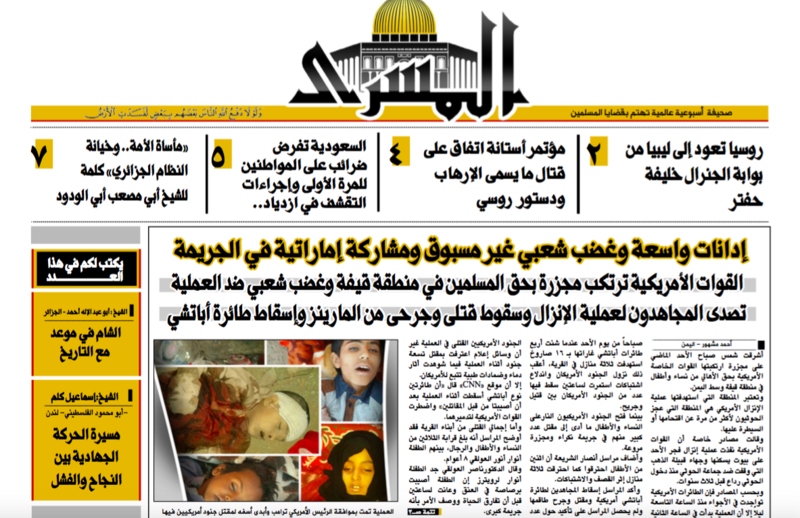 Al Masra, a newsletter affiliated with AQAP, also included an article in its 38th issue denouncing the raid. Although Al Masra describes itself as being “independent,” FDD’s Long War Journal assesses that it is actually produced by al Qaeda for its global membership. 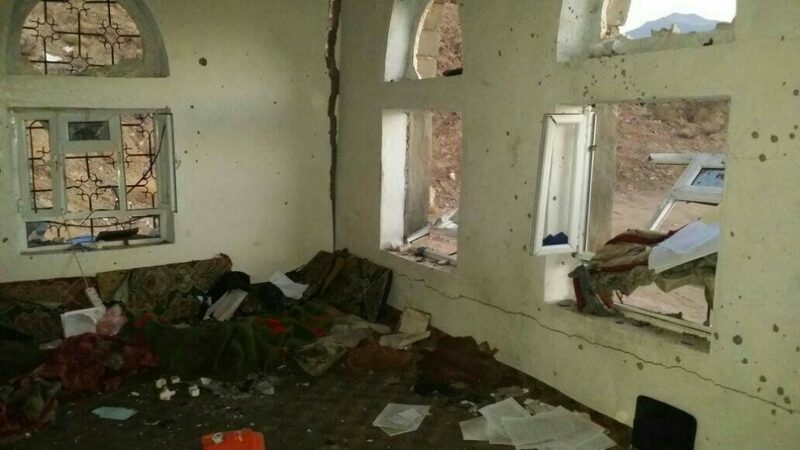 AQAP remains a potent foe inside Yemen, as the group is waging a prolific insurgency and has been able to control significant territory at times. Citing local residents, Xinhua reports that AQAP seized three towns in the Abyan province earlier today. Al Qaeda “gunmen” reportedly set up “checkpoints” in Lawder, Ahwar and Shuqra. AQAP captured much of southern Yemen in 2015 and held it for approximately one year, until an Arab-led coalition invaded the country in April 2016. Instead of sustaining significant casualties, AQAP’s forces simply melted away, living to fight another day. The al Qaeda arm continues to control significant turf through its partners, including local councils and committees. First off, these idiot clowns(? )declared war on the u.s. first in 1998. REMEMBER 9-11 ? ALL INNOCENTS. so anything they got they deserved! ! Lie with terrorists, die with terrorists… sorry. We need to obliterate terrorism, and that means terrorists and their wives (baby terrorist factories and nurses) and kids (future terrorists, e.g. Hamza Bin Laden et al.). SEALs die in combat. Don’t join SpecOps if you aren’t ready for the white light. So was this the daughter of the “exploding bride”? Looks like she could be. Never can tell w these polygamists. A bit flummoxed as to how they got this “statement” produced and out so fast. Don’t they have to run it by the Old Egyptian in Pakistan? Where is Ibrahim Al Asiri? Was he connected to this compound in any way? Just curious, are the Saudis doing everything they can to help us find that murderer? Even radical muslims play the liberal hypocrisy card. If they don’t want their human shields killed, stop using human shields. How unusual was it to have Emirati and Yemeni commandos on a mission like this? Can you imagine doing Abbottabad w Pakistanis and Saudis along for the op? I say bad call CENTCOM. My guess is these folks tipped our hand somehow, if only joining up and training with gringos. Could have been a dog barking but more likely was the enemy monitoring their co-religionists. Or someone saying bye to their family. Keep up the hard work. RIP brave chief. Who the hell are these guys kidding? They kill women and children all the time, and the only difference is — they do it ON PURPOSE! Not to mention deliberately using women and children as human shields, a war crime. Who the hell is fooled by this stupid nonsense?